A&T “Mobile” Truck Road Service is a 24-hour, 7-days a week roadside mobile truck repair service for light and medium-duty to heavy duty commercial trucks. We will go just about anywhere for anything, at any time. At A&T “Mobile” Truck Road Service we like to think of ourselves as the “Ambulance Service for Trucks.” If your truck is broken down, we will come to you and perform the necessary triage to get you back on the road. A&T now includes towing, load adjustments and more. We repair engines, axles, brakes, electrical, hydraulic, tires and wheels, trailers, air brakes and hoses, transmissions and we even do a little body repair when needed. We carry replacement parts and all the tools we need to get whatever needs fixing done as quickly and efficiently as possible. Most of the time, we can do the repairs at the site of the truck breakdown. If we need to take it to our shop, we have a full-service truck repair facility with the capability to service and repair virtually any truck or trailer. We now offer in-house towing, load adjustments, fuel delivery, crane inspections, glass replacement, vehicle rentals, vehicle storage, welding, new and used tire replacement, liftgate repair and service, and welding services. At our facility, we have tens of thousands of parts, fittings, filters (we have one of the largest selections of Baldwin filters in the U.S.), brake linings, belts, hoses, brake drums, electrical parts–you name it and we probably have it and if not, we can get it very, very quickly. We have a large selection of Grote lighting products including LED. We stock a huge selection of Goodyear belts and hoses for all truck uses. 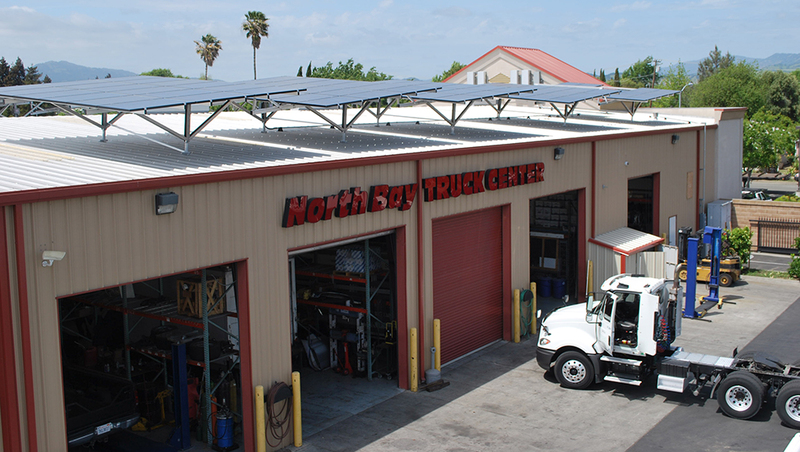 Our entire business at North Bay Truck Center and A&T Road Service is fixing your truck right the first time in the minimum amount of time. We are also available to come to your shop for repairs and routine service of your fleet in order to keep your downtime to a minimum and your business moving and prosperous. A&T “Mobile” Truck Road Service is a part of the BIT Inspection Program and is able to do inspections for you on-site. We are DOT Certified and all BIT inspections are performed utilizing DOT/BIT Inspectors. A&T “Mobile” Truck Road Service meets all requirements under Title 49 of the DOT Inspectors Guide. You can find more information about the CalBit Program and the requirements at their Website. We are centrally located in Fairfield CA which is approximately 45 miles from San Francisco or Sacramento and about 50 miles from Stockton. We regularly service Fairfield, Vallejo, Rio Vista, Napa, Vacaville, Travis AFB, Winters, Dixon, Davis, Benicia, St. Helena, Calistoga, Suisun City, Green Valley, Crockett, Hercules, San Pablo, Richmond, Concord, Walnut Creek, Martinez, Boyes Hot Springs, Sonoma, Allendale, Cordelia, Pleasant Hill, Pittsburg, Antioch, Novato, American Canyon, Truck Scales and much more. We’ve even gone as far as San Jose, the South Bay and the Peninsula because we always answer the phone 24/7. Solano County is our home turf, but readily service Napa County, Yolo County, Contra Costa County, Sonoma County, Sacramento County, and San Joaquin County, Alameda County and Marin County. We also have been known to travel to San Francisco County, Santa Clara County and San Mateo County. In fact, if you need immediate service, we will travel where ever we need to in order to take care of your problem. We are at your service and we mean that sincerely.